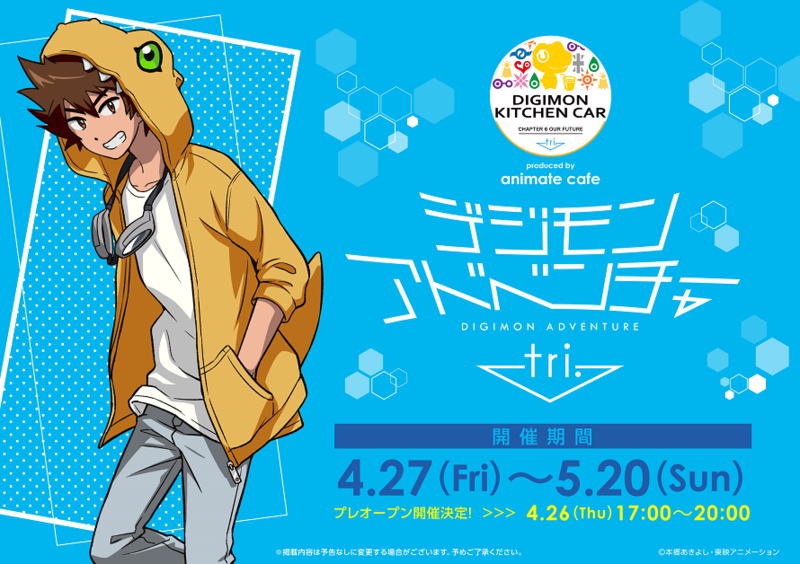 This time it's the Digimon Kitchen Car Produced by Animate Cafe. The Digimon Kitchen Car looks like it'll be a food truck with themed food, drinks, and exclusive merchandise. The exclusive merchandise will likely feature new artwork of the characters, which will no doubt also be used as key art for the Kitchen Car. We have a really nice preview of the artwork for Taichi, featuring him wearing an Agumon hoodie. In addition we get a look at a logo/sigil for the Kitchen Car featuring the various crest symbols along with a very cute Agumon and a drink. The kitchen car will be in front of the Animate Ikebukuro head office between April 26th and May 20th. April 26th will be a preview night where it will only be open between 5 and 8 pm. The official opening will be on April 27th. Past the preview night it will be open between noon and 8pm on weekdays and 11am to 7pm on weekends and holidays. April 26th to the 30th will take reservations via a lottery system, but beginning on May 1st thru the end of the Kitchen Car it will be first come first served. Reservations can be applied for here until April 11th at 9am. Winners will be informed later on April 11th. The exclusive food, drinks, and merchandise will be announced soon. Unless I'm mi-sremembering, I think the last time there was a tri. Animate Cafe event was when tri. Part 1 first came out. I wonder if they will sell hoodies of each character?! Yeah yeah, that's all very nice. But I need that hoodie right now. Just imagine Gabumon's and Patamon's...! This is a great idea and everything about it is great. ...You think they would sell the hoodies?